These are just a handful of the most common interview tips for job seekers, but a person’s posture may also be a deciding factor for whether they land a coveted position – even when the person on the other side of the desk is in a more powerful role. 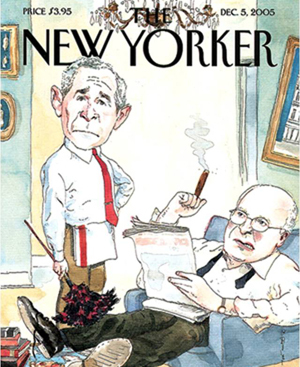 The cover illustration on the Dec. 5, 2005 issue of the New Yorker magazine “is a classic example of how indicative posture can be in determining whether people act as though they are in charge,” Professor Adam Galinsky says. According to new research from the Kellogg School of Management at Northwestern University, posture plays an important role in determining whether people act as though they are really in charge. The research finds that “posture expansiveness,” or positioning oneself in a way that opens up the body and takes up space, activates a sense of power that produces behavioral changes in a person independent of their actual rank or hierarchical role in an organization. More importantly, these new findings demonstrate that posture may be more significant to a person’s psychological manifestations of power than their title or rank alone. Led by Kellogg School of Management professor Adam Galinsky and Kellogg PhD candidate Li Huang, along with Stanford Graduate School of Business professor Deborah Gruenfeld and Stanford PhD candidate Lucia Guillory, this research is the first to directly compare the effect on behavior of having a high-power role versus being in a high-power posture. The paper is titled “Powerful Postures Versus Powerful Roles: Which Is the Proximate Correlate of Thought and Behavior?” and appears in the January 2011 issue of Psychological Science. Although not anticipated by the researchers, they consistently found across three studies that posture mattered more than hierarchical role – it had a strong effect in making a person think and act in a more powerful way. In an interview situation, for example, an interviewee’s posture will not only convey confidence and leadership but the person will actually think and act more powerfully. “Going into the research we figured role would make a big difference, but shockingly the effect of posture dominated the effect of role in each and every study,” Huang noted. To test their theory, Galinsky, Huang and co-authors conducted three experiments to explore the effects of body posture versus role on power-related behaviors. The first two experiments demonstrated that when individuals were placed in high- or low-power roles while adopting expansive (i.e. open) or constricted (i.e. closed) body postures, only posture activated power-related behaviors. In the expansive posture condition, participants were asked to place one arm on the armrest of a chair and the other arm on the back of a nearby chair; they were also told to cross their legs so the ankle of one leg rested on the thigh of the other leg and stretched beyond the leg of the chair. Conversely, in the constricted posture condition, participants were asked to place their hands under their thighs, drop their shoulders and place their legs together. During various tasks such as a word completion exercise and a blackjack game, participants with open body postures were thinking about more power-related words and generally took more action than those with closed body postures. Although people in a high-power role reported feeling more powerful than did those in a low-power role, the manipulation of role power had little effect on action. These findings demonstrate that role and posture independently affect participants’ sense of power, but posture is more responsible for activating power-related behaviors. In a third experiment, the researchers demonstrated that posture also has a greater effect on action than recalling an experience of being in a high- or low-power role. Participants verbally recorded a time when they were in a high- or low-powered position while adopting either expansive or constricted body postures, and were then asked whether they would take action in three different scenarios. Participants in the expansive body posture condition took action more often than those with constricted postures, regardless of whether they recalled a time of being in a high- or low-powered role. According to Galinsky, the role of powerful postures is important for those seeking new jobs in 2011. “With 1.9 million new jobs on the horizon this year, our research suggests that your posture may be quite literally the way to put your best foot forward in a job interview,” said Galinsky. MORE INFORMATION: To arrange an interview with Galinsky or Huang, contact Aaron Mays. For more information about this study, please contact: Adam Galinsky at agalinsky@kellogg.northwestern.edu. The APS journal Psychological Science is the highest ranked empirical journal in psychology. For a copy of the article “Powerful Postures Versus Powerful Roles: Which Is the Proximate Correlate of Thought and Behavior?” and access to other Psychological Science research findings, please contact Keri Chiodo at 202-293-9300 or kchiodo@psychologicalscience.org.